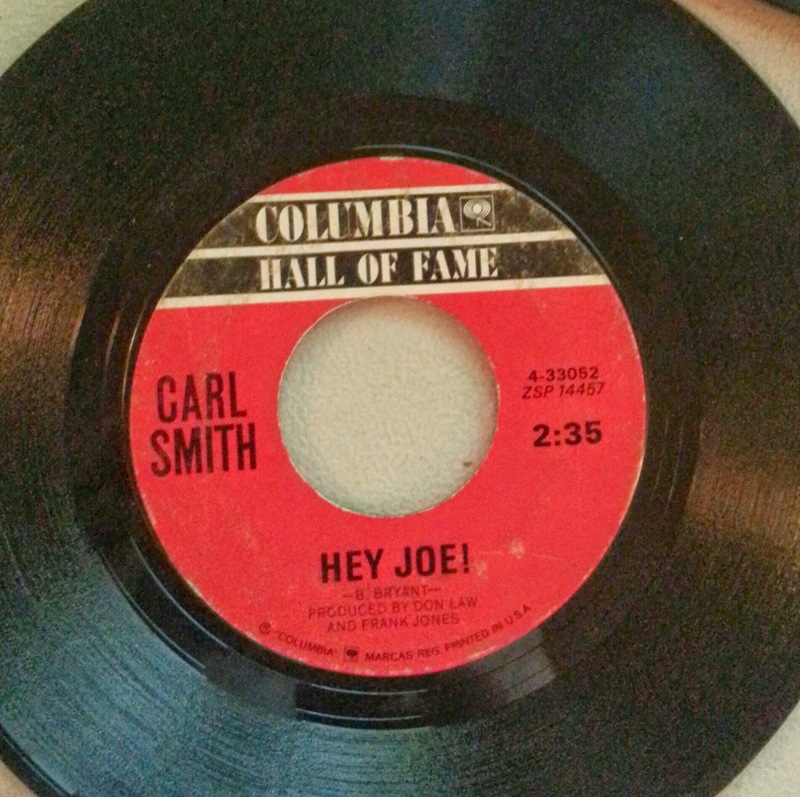 According to 45cat, Columbia released this Carl Smith 45 in 1963 as part of their Hall of Fame series. 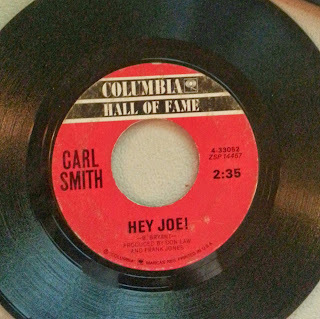 The A-side is a single from 1953, "Hey Joe!" (not the Hendrix song), and the flip is a single from 1954, "Loose Talk." Per Wikipedia, Carl Smith was from Tennessee, known as "Mister Country" in his heyday, was June Carter's first husband, and was one of country music's most successful artists during the '50s. He was inducted into the Country Music Hall of Fame in 2003 and passed away of natural causes in 2010, at age 82. "Loose Talk" was written by Freddie Hart and was number one on the Billboard C&W charts for seven weeks. "Hey Joe!" was written by Boudleaux Bryant, who co-wrote with his wife the Everly Brothers songs "All I Have To Do Is Dream," "Bye Bye Love," "Wake Up Little Susie," and that Nazareth song you love. And a lot of other songs, including Bob Moore's "Mexico," which is a cool song. "Hey Joe!" spent eight weeks at number one. I borrowed this 45 from my in-laws, but Youtubers have already posted both songs. So here they are, and here's another 45 off my checklist! Sweet.